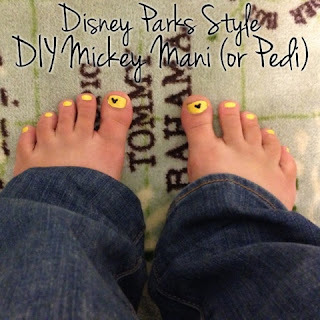 Picturing Disney: How to do your own Mickey Mani (or Pedi) at home!!! How to do your own Mickey Mani (or Pedi) at home!!! Last year when I was heading to the parks for a long weekend trip I realized at the last minute that my toes weren't very flip flop ready! I quickly gave myself a pedi and stumbled upon a super easy way to give yourself a Mouse Ears icon on your nails! 1. Start with a fresh pedicure that has at least set- no wet nails! 3. Remove the cotton from one end of the Q-tip as best you can- mainly you want the tip to be cleared of cotton. Practice on a piece of paper and carefully dip the cotton end of your Q-tip in black polish. You should get a feel of how hard to push down to get a decent circle. Do the same with the other end (that you removed the cotton from). Your cotton end will make a bigger circle and you will use it for the head while the bare end will be used for the ears. Variations for nails: I have never done this as a Mickey mani but have made tiny mickeys before. You can create smaller circles by simple touching your nail more lightly with the Q-tip ends. PS- Yes, I know I have Fred Flintstone toes. lol.